Do you understand the Bujinkan? 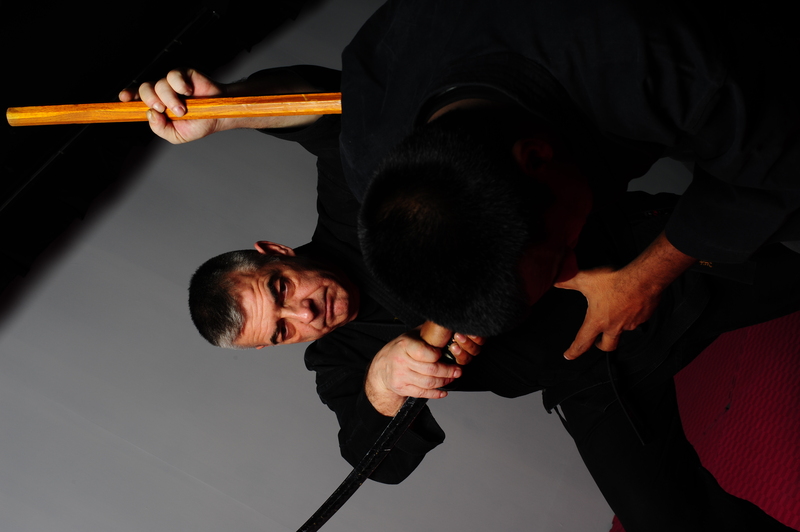 Do you really understand what the Bujinkan is? When I give seminars, I am always astonished to discover the misconceptions carried out by so many teachers and students all over the world. As I said once during a seminar: “no one is forcing you to claim to be “Bujinkan”, if you want to do your own stuff then do it but do not call it Bujinkan!”. So it was a real pleasure last week-end to meet Manolo Serrano’s group in Belgium and spend some time with him and the Mitrou brothers from Greece. All of them being 14th dan, it was good to share our common vision of the art. On the way back, I thought it would be appropriate in this blog to refresh our memories about what is the Bujinkan really is. When Hatsumi sensei began to spread his vision on budô and to share it all over the world, there was no plan, no step by step process going on. Hatsumi sensei was only sharing his knowledge to everyone willing to listen. Then in 1983 he published, in Japanese, his first “ten chi jin ryaku no maki” detailing the basics and fundamentals of our art. A revised version of it translated into English reached us in Europe in 1987. Ten years later Hatsumi sensei decided to move on and established a theme and a concept to work with for each year. In 1993, I was lucky to be already jûdan in the Bujinkan so I had enough basics to follow sensei‘s evolution in his teachings. As many Bujinkan practitioners of today were not students at that time, I want to list here once again those themes that created the art we know now. Jo jutsu – 3 feet staff (1997). During the Valencia Taikai (1995) and again in Sanmyaku (the Bujinkan newsletter of that time) Hatsumi sensei said that “bô, yari, naginata are the sanshin no kata of long weapons”. Jûtaijutsu – takagi yôshin ryû (2002). This second cycle of 5 years that can be related in some way to the gogyô allowed us to understand (through training within specific schools) the various way of meeting the opponent and adapting our ways of fighting to the situation. Kuki taisho – sword and yoroi (2007). The juppô sesshô has discouraged a lot of practitioner and even today many of the shidôshi really have no clue of what has been studied during these 5 years. Many teachers do not understand the depth of what we have been receiving. How many of them know that the techniques of the kukishin ryû bô jutsu were used to teach the feeling of kasumi from the gyokko ryû? Also the move from “happô” to “juppô” has to be seen as some kind of a quantum leap in the world of Bujinkan physics. This juppô sesshô cycle ended the series that we can now see as a kind of ten chi jin. We all know that the ten ryaku deals with footwork (angle, distance); the chi ryaku with the body mechanics (budô taijutsu); and the jin ryaku with a mix of everything (moving from body to spirit). This 3 steps progression (sanpô) of 5 years (gohô) therefore can, or should, be considered as the true kihon happô of the Bujinkan (3×5=8!). Rokkon shôjô – happiness is the essence of life (2010). If Hatsumi sensei follows the 5 year cycle that he, apparently followed until now, we can expect the end of this for 2012. But this is only a guess. Previous Post Do you have a good connection? It seems Soke is teaching us over a long period. Maybe this is why people are not looking as to what we are doing but what people want to see. Over the past 10 years it seems that Soke also has given us a teaching of another kind. It went from muscle to bone, to natural movement and then last year to concentrate on what we have to learn over the time we have been learning. Maybe it has been drawn out but it seems there is a method to his thinking and people are not asking questions enough to get the answer. Of course the Year 2012 – and it fits again the idea of coming in a new dimension. The end of the more than 3000 years old cycle will be as well for our concept of living a start in a new era… For me it fits as well the idea of shu ha ri. The first 3×5 periodes were to understand the base of the way of ninpo. The period we are in now is to break the form we gave our art by thinking its just an martial way. We discover that there is a broader concept of living beyond the martial concept. As sensei often said in the last years: what is beyond is the same in every art. What will be after 2012? Maybe what is behind the concept of “ri”? Let’s imagine, that we are the beginning of a generation of people that are able to move in nature fully integrated. Focussing space and creating thereby a harmonic reality for us and others. I just like your idea Arnaud and i’m very sure that ninpo ikkan will bring us to a point far beyond the normal understanding of martial art. This is a very good post, Arnaud. It is very important to step away and take time to digest what Soke is teaching. For many people living in Japan, this is impossible because they are at the source. For those who leave Japan to start anew elsewhere, they come to see the pure breadth and depth of Soke’s teachings for the first time. Based on my conversations with many returnees, it takes at minimum three years to begin to frame/comprehend what one has learned. Thanks for sharing this information to all of us. Help to understand what Soke is teaching and the evolution of Bujinkan in all moment. Thank you very much for a great overview! I wonder if rank is loosely considered in the same fashion? Up to godan, ten. Judan, chi…. Yes definitely, ten goes to godan, chi to jûdan and jin up to jûgodan. At least this is what I remember sensei explaining one day at the honbu dôjô. Realmente facinante todo lo leido en este blog. Lo unico que puedo recordar es que Sensei repite que todos nosotros (la gente que relativamente estamos empezando en Bujinkan) debemos entrenar con los Decimo quinto Dan.